Crow died when he landed on the wrong part of an electric power line just after noon on Wednesday. It took two and a half hours for the part to be replaced and the electricity to come on again in the four houses that were affected. Crow had been inhabiting our yard for more than a week. He was newly out of the nest, still accustomed to being fed, and he spent most of his -- and our -- waking hours demanding to be fed. Screaming to be fed. The inside of his mouth was brilliant red, still detectable after death. Despite the fact that we had been putting out abundant crow food well within his reach, he wanted his parents to bring it to him, and would fly to wherever they were perched to do his demanding, even if they were much farther away than the food. One parent -- crow genders are tricky -- would simply fly away after a certain amount of time, while the parent in the picture here would sit patiently, and then let out a withering sequence of caws that would have made any other creature shut up permanently. Crow did not shut up. He demanded more, and then would move closer and closer to the parent, apparently trying to groom, if not snuggle. So we don't know if he ever quite learned to feed himself. Our yard was raucous with crows all summer, but since Wednesday noon, we haven't seen a one and the quiet is disturbing. I have seen the parent in these pictures down in the park, three blocks away. These crows were tool-users. We frequently saw them poking in the chimney of the house next door, and under the edge of the roof with sticks about 4 inches long. Most mornings they would wake us up by skiing down the roof over the bedroom, claws scraping along the slates, and they have spent much time pecking on things under my desk window, just out of sight. We put food for the crows on the roof of the shed under the lilac bushes, and it took them several weeks to feel secure about coming down into such close quarters. Often Squirrel or Ms. Squirrel would get to the food first -- squirrel genders are quite easy -- and then it took the crows a few more days to come down and eat with the squirrels. The squirrels hated it and the crows did, too, but neither side was willing to concede. Alexandra dug a hole for Crow where we used to keep the beehive. He was surprisingly light in the hand. Some famous ornithologist said that if humans were birds, very few of us would be intelligent enough to be allowed to be crows. We had great expectations for Crow. The Knight and Death, Durer etching, 1513. 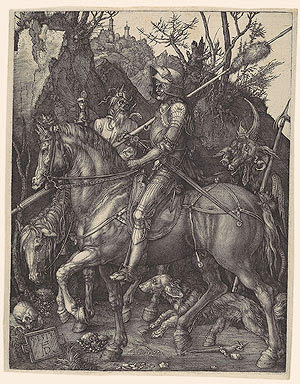 The night before 9/11, I was working on a translation of Gatsos' great poem, "The Knight and Death," a title he took from this Durer etching. The next morning as I stood in the crowds watching the astounding beauty of minute red flames flickering in the pillars of cloud, fragments kept buzzing in my head - - I saw your descendants like birds / rip open the sky of my country / and I saw the cypress trees of the Morea stop breathing on the plain of Nauplion . . . Gatsos speaks of April 1941 but the poem has become something of a talisman for me, and I have used its title for my book on the Morea. For this tenth anniversary of that terrible day, I am printing here my translation and Gatsos' original from my translations of his complete poetry. in the mud and blood of Holland. but for pruning hooks and plows. Translation copyright © Diana Gilliland Wright, September 2001. Μέ τοῦ Πλαπούτα τ᾿ ἄρματα καὶ τοῦ Νικηταρᾶ τὶς πάλες. Μέσα στὴ λάσπη καὶ τὸ αἶμα τῆς Ὁλλανδίας. Θὰ λάμπει ἕνα ἄστρο σιωπηλὸ σὰν ἀνοιξιάτικη μαργαρίτα. 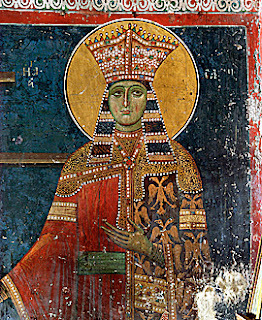 Ἀλλὰ γιὰ κλαδευτήρια κι ἀλέτρια. 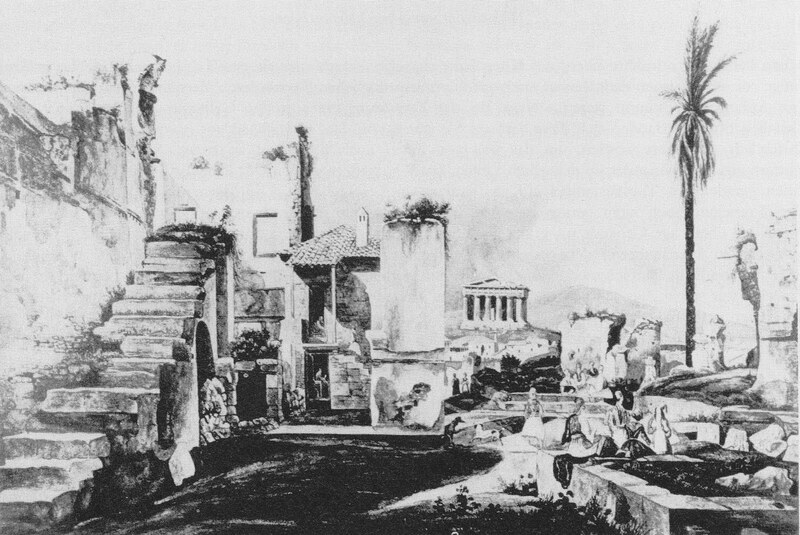 Bettina and Konstantinos Schinas went to Athens in December 1834 to find a place to live, before they moved in March 1835. After they returned to Nauplion, Bettina wrote her family about her impressions. Here in Nauplia we heard so much about the shortage of lodgings etc. in Athens so I actually expected to find only ruins or half destroyed buildings. I was very surprised then at the first sight of the town, bending from a small hill, of significant extension and full of new houses. But when I got off the horse and searched on foot for the little house of Mme. Gerakis I found myself in a boundless labyrinth of ruins. . . . Look at the plan of the city and the surrounding hills, if you can, at Schinkel’s and . . . my description becomes more graphic to you. 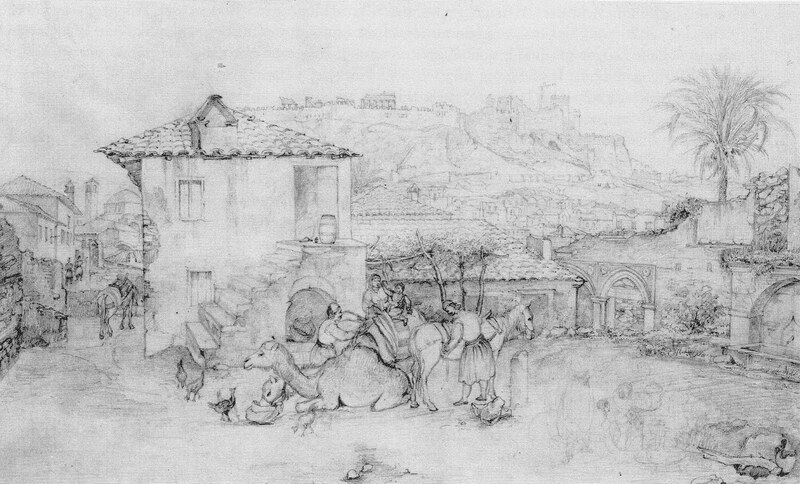 The city lies in a wide big valley, at all sides of the plain mountains rise; not towards the sea though, only small hills at the sides of the Piraeus. In this plain lies the rock on which the Acropolis stands, the midday side oriented to the sea. The morning sun shines on one narrow side of the rock where it steeply ends towards the plain; at the other narrow side several hills string, flattening out; the Areopagos, the hill of Nymphs (adjacent to the higher rocky plateau where I possibly will get a little house, it flattens towards the big road from Piraeus; in front of the rock which would carry the house is on the same level a garden plot with a steep end. If I could build here no neighbor could take away my view and my house would be standing free on all sides -- I could look over the Piraeus to Aigina and indescribable beautiful mountains in the distance; the big olive forest, the ships coming into Piraeus harbour, everybody coming from there to town; a few hundred steps below me the future palace and it’s future park reaching to our rock, the Thesion and the whole city; if I could look at the Acropolis from the second floor I do not know yet), the hills of Pnyx, Philopappos etc. 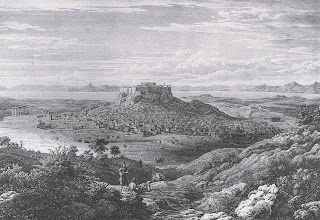 The city leans with its widest extension to the northern side of the Acropolis rock, descends from here to the plain and expands far to both sides. 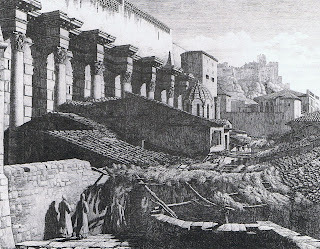 The district close to the Acropolis where the ancient town mainly must have been exists only in ruins of younger times. The government did not yet explain clearly about intending future planned excavations or not, so there is no house building here as well. A few individuals built new houses here, either because they were owners of wrecked houses and so did not have to pay for plots, or because they could buy an inexpensive plot because there is not much competition in this district and construction material can be found more or less at the spot as the remaining pieces of walls and rubble between them provide building stones. How messed up these houses are standing is incredible however. There are no streets laid out, the former ones are hardly recognizable just now and then, cut off by rubble, turned into hills and valleys. Two new houses next to each other will surely not stand in a line -- one orients its facade to the north, the other to the south, just as the owners feel it convenient. If one tries to draw lines from one house to another one would bump into them very often in obtuse or acute angles. You see forms and shapes here like nowhere else in the world, a real collection of varieties of stairs going outside diagonally upwards, others start at the entrance of a yard rising straight over it to the 2nd floor, Swiss shaped houses with prominent roofs and upper floors etc.. Most owners are builders as well. Instead of lime everything found in the street is put between the stones, that is rubble, sand, dirt, everything that can be mixed in a pit dug for this purpose like for slaking lime. It happens not only for small houses -- for example the big house where Heideck lives, built by an Italian Count as a rental has walls leaking all over when it is raining continuously; in setting up a stove the wall involved was found to be made of dirt. If the government decides for the excavations, the newly built houses will be torn down: if it decides against, a plan will be made and still many houses will have to come down which do not fit into further streets. The rent however is so expensive people took the risk hoping for years of indecisiveness, which one can indeed expect. There is such a labyrinth here you will not easily find again a house even after a visit. Best is to climb somewhere high looking for the right house, after finding it walk from which point ever in a straight not losing its direction, crossing walls, rubble, pieces of stairs, broken water pipes, open cisterns, deep sewers etc.. I had one point, an open, very deep half-dried cesspool with a snowy-white skull of a horse lying in it, from there I could find orientation. The summer’s conveniences for the inhabitants of this district are millions of very poisonous midges living under hollow wet stones and in stagnant waters. The convenience of winter is the lack of sun in the shade of the Acropolis, in summer it shines over it and the cooling wind from the sea does not get here because of the high rocks. In flattened areas new streets have been laid out with many new houses in rows with more or less ruins between them. This center of the town -- if one wants to call it so as the market and the shops are here -- consists mostly of small quickly constructed buildings of little value, which are of intense interest at the moment with the lack of houses but will exist only a few years. But there is also a fair number of good houses of 6-8 rooms etc., and not just few considerably big ones inhabited by diplomats, ministers, regency etc.. Were all these latter buildings and the reasonable middle sized ones built according to town planning it would be the basis for an orderly town and not insignificant at all. There was a plan drawn up about 2 years ago by Kleanthes and other Greek architects and temporarily approved which set the king’s palace far away from the now existing buildings (where the king laid the foundation stone last year which was in all the newspapers), Klenze made another plan, putting the palace near the temple of Theseus, a little closer to the road to Pireas. 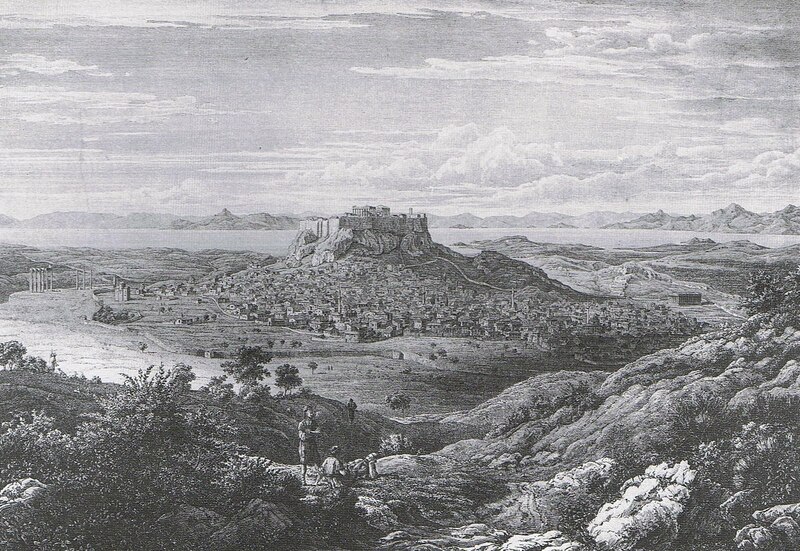 At the moment the king lives at the opposite end of the town in the district of the remains of the temple of Zeus but far of the Acropolis, deeper in the plain. Supporters of Kleanthes’ plan built close to the site of the palace he is proposing, others were built near the king’s were they are needed now, others along the road to Pireas. In a very wide and enormously long street (in the future, maybe!) are standing right now two very big and beautiful houses like fallen out of the blue, Kobel and Armansperg are living there, also the houses of Caradja, Dawkins, Cantacuzenos are separated from all other houses. Communication is extremely difficult at the time being and almost impossible with bad weather or in the evening. Even where the streets have been cleaned of piles of rubble one must walk hills and valleys, there is no base because of the lack of pavement. In addition water pipes are broken in many places, the delicious clear water is running and building muddy spots until it vanished in canals. To remedy this trouble ditches are dug towards the canals but they get sodden and everything stays the way it is. Streets have been dug in the middle to their full length to build the draining ditches, the ground has been thrown up at both sides. The street lowers to the ditch and is very slippery, and the results can be unpleasant and dangerous you can imagine. Cisterns and wells of former yards where now paths are leading have no edges and might make a wanderer disappear without a trace at night. Big dogs have been bought everywhere as guards for the isolated lodgings at the time being, as soon as it gets dark they bark behind pedestrian from house to house. The ruins here come partly from small houses of Athenians, from big Turkish palatial buildings, from 365 churches and chapels and between them ancient ruins which have been unearthed only by the latest devastation. The remaining walls of destructed houses give a strange impression because between the stones they have been built of, or the clay and timber frame parts are single square stone blocks visible, obviously from ancient walls, pieces of marble slabs, columns, knobs, statues (from a small wretched house a most beautiful marble hand is jutting out), marble slabs with new Turkish decoration, from Venetian times many lions etc.. Many Turkish wells, now dried out, at the walls. From the former 365 churches, most of them small of course, one can see next to nothing, just some bigger cupolas, no towers, because churches were not allowed to be seen under Turkish rule. These building too have a wonderful mixture of most different materials, times, stiles of construction, fresco painting etc.. Many of them are buried like Constantine’s arch at the forum. Some of them are built into ancient buildings. A Turkish bath (with steam pipes) which lies now like a cellar deep dark and moist is getting whitewashed and done up for soldiers. Between all this chaos the ancient ruins give a moving and reassuring impression. Though many of them are partly hidden by lodgings which have been built at or in them it is planned to clean them all and leave them standing as they are. They are rather many, even now when the overview is not yet complete. I mentioned the war bringing to light a number of antiquities. Amongst them are some colossal statues which obviously remained on the original pedestals and at the spot they were made for. They were found on the occasion of the destruction of a big building belonging to a clergyman. He had built walls around them 300 years ago (if I am not mistaken) to keep safe what had remained of them. 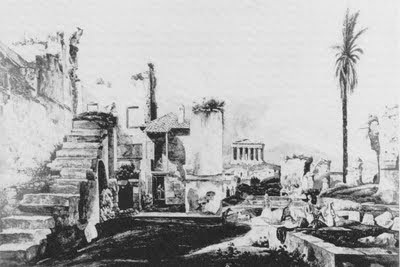 They stand in line and regular distances, two lines of them facing each other, the road between them leads straight from the temple of Theseus to another ancient building. The mass of marble is huge but the mutilation too is not little: there would be little interest for them in a collection, but here where they offer information about situation, buildings etc. of the ancient town they are regarded with admiration and pleasure. I should now tell you about the antiquities but I confess honestly I can’t. We were not in Athens for very long. I didn’t have any time of peace.